Here at Sam's Computers we take pride in a job well done. We want to make sure that all of our customers are happy. 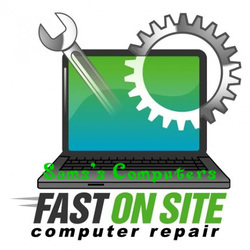 We try to make sure your computer is fixed in a timely matter. We try to work with out customers. If you cant pay on time please call us we will work with you on your payments. We give monthly deals. While we are fixing your computer we give you a computer to use until we fix yours. When your computer is giving you problems please call us.